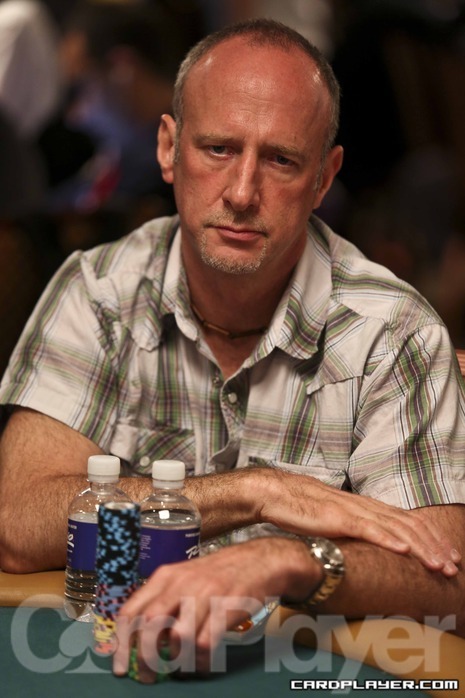 With a flop of 9 8 6 , the player in the small blind checked and Jonathan Little bet 1,200. The player in the cut-off re-raised to 3,500 and it folded back to Little, who took a moment before announcing that he was all-in for 17,100 total. His opponent quickly called with the A 7 for the nut-flush draw and an open-ended straight draw, while Little rolled over the 9 9 for top set. The turn and river brought the A and J , keeping Little’s set best and doubling him up to around 35,000. Jonathan Little raised to 500 from under the gun and was called by Giuseppe Pantaleo in middle position, Andrey Pateychuk in the small blind and the big blind. The flop came down J 9 8 and Little continued for 1,200. Pantaleo raised to 2,600 and everyone folded to Little, who moved all in for 7,625 total. Pantaleo called and revealed K K , but Little was still alive with A 9 for middle pair and a flush draw. The turn and river fell 8 6 and Little doubled up to around 17,000. Pantelo was left with 24,000. An interesting table is forming right in front of our desk with top pros Govert Metaal and Erick Lindgren. Tom McCormick was also seated here, but he was knocked out already in the early goings. Lindgren made a big splash this year with a second place in the WPT Championship for $650,275 and a WSOP bracelet win in the $5,000 6-max for $603,317. Lindgren is having his first million dollar tournament year since 2008 when he won his first bracelet. Lindgren’s troubled financial status was widely publicized earlier this year, but his recent result seem to have steered him into the right direction. The Card Player Poker Tour Venetian Deep Stack Extravaganza III could make the number 21 on the all-time money list’s summer even sweeter than it already is. Govert Metaal notched up three cashes this summer, but he’s still looking for a big score. A 28th place in the $3,000 No Limit Hold’em Mixed Max event was his best result, but that’s not something the Dutch pro will satisfy. Metaal made back to back PCA High Roller final tables in 2011 and 2012 and won two EPT side events in the previous seasons. As of right now Metaal has $1.2 million in live tournament earnings and that puts him 11th on the Dutch all-time money list. Jonathan Little has had a good summer in Las Vegas and he’s also trying to add some more to it. Little finished third in the $5,000 6-max, the tournament Lindgren managed to win, for $283,833. In total Little has $5.2 in career earnings, the lion share of that coming from two WPT victories in 2007 and 2008 for a combined $2.1 million. Jonathan Little is still chip leader with 335,000 but he just lost a sizable pot to John Holley. The board read 6 9 4 K and the action was checked to Little who fired out 7,500. One player folded after which Holley check-raised to 20,300. The player to Holley’s left folded and Little made the call. On the river the 5 hit and Holley bet 33,000. Little took his time and eventually he decided to make the call. Holley tabled K 9 and that was enough to take the pot down. Little immediately directed his attention to his notepad and wrote down a bunch of notes on this hand. “What happened to Sands?” Martin Hanowski just asked yours truly. We explained that David Sands was knocked out before the dinner break and that Joseph Cheong took some of his chips. “Of course, he’s a freak!” Hanowski said with a smile while trying to get eye contact with Cheong who was sitting a few tables away. “I heard my name,” Cheong said as he pulled out his earbuds. “He said you’re a freak,” we explained and Cheong laughed about this interesting comment. After this we tried to point out to Hanowski that Jonathan Little is the tournament chip leader with more than 400,000 chips. Hanowski is in good spirits while both Little and Cheong are quietly listening to music during the long grind this tournament is. Jonathan Little just won a massive pot and he now has close to four times the average stack. Little raised to 2,500 under the gun and five players decided to call among which Michael Fosco in the big blind. The flop brought A Q J and it was checked to Little who bet 7,500. The action was folded to Andrey Pateychuk who called on the button. Fosco raised to 22,500 from the big blind the action was back on Little who chucked a large stack of blue chips into the pot with the announcement that he was all in. Pateychuk tanked for a long time before folding. Fosco took some time as well, but he eventually decided to call all in for around 100,000 chips. Little showed A J and was up against Fosco’s K 5 . Fosco had plenty of outs but the turn brought the Q . On the river the K hit and Fosco was knocked out. Little is up to around 400,000 chips and he’s clearly crushing the tournament. Andrey Pateychuk raised to 1,600 in late position and Jonathan Little moved all in over the top for his last 15,825 from the button. James Epner called out of the big blind and Pateychuk folded. Little showed A J , but he was dominated against Epner’s A Q . The board ran out 6 5 3 2 4 and the players chopped up the pot with a straight on board. On a Q K K flop we saw Martin Hanowski bet 15,500 from the blinds and Jonathan Little called from late position. On the turn the 9 hit and both players checked. The river brought the 10 and Hanowski fired out 41,500. Little raised it up to 110,000 and the German pro thought for a while before he ultimately called. Little showed A J and took down the pot. Hanowski looked utterly frustrated as he dropped down to 570,000 chips after having had more than 1.5 million not too long ago. Little is now sitting on 1,150,000 and he is the tournament chip leader. Carlos Villamarin just raised to 11,000 and Jonathan Little defended his big blind. The flop brought 3 5 K and Little checked to Villamarin who bet 30,000. Little check-raised to 75,000 and Villamarin decided to come back over the top to make it 150,000 total. After some tanking Little shoved all in and Villamarin made the call. Little tabled A 9 for the flopped nuts and Villmarin was drawing to running straight flush cards with 6 8 . The turn brought the 8 and the river the 9 . Villamarin’s hand did not improve and he lost all of his 400,000 chips. Little is now sitting on around 960,000 and he’s firmly in second place behind Martin Hanowski. Lee Markholt raised to 100,000 on the button and Jonathan Little reraised all in for 935,000. Lindgren reraised all in over the top of Little and Markholt folded. The two remaining players then folded. Little was eliminated in third place and Lindgren grew his stack to 6.15 million in advance of the heads-up final with Markholt (1.6 million). First, Lee Markholt doubled up when he made a straight holding a nine on a board reading J-8-8-Q-10 against the K-3 of Connor Drinan. That put Markholt up to 1.3 million and had Drinan down to 1.6 million. The next time Markholt moved all in he held pocket aces. Drinan was his opponent once again and he was behind with Q-J. The board ran out K-8-6-2-3 and Markholt doubled again, this time growing his stack to 2.6 million. Drinan was now down to 585,000. Connor Drinan moved all in on the button for 485,000 and Jonathan Little called on the big blind. The two players then tabled their hands. Little won the hand with a spade flush and to grow his stack above 2.3 million and Drinan was eliminated in fourth place. The final table of Event No. 32 ($5,000 Six-Handed No-Limit Hold’em) has begun, and Card Player will be posting level-by-level updates with all major hands, current chip counts, and prize payouts. Be sure to check back with Card Player at the conclusion of each level for regular updates with all major hands, current chip counts, and prize payouts. Pilgrim doubled up on the hand and he now holds close to 70,000. Little was eliminated on the hand in 23rd place and Fischer held 500,000 as the new chip leader. Check out this poker tweet from Jonathan Little. There was a board that read A 8 8 4 sitting on the table when Jonathan Little checked from the big blind. 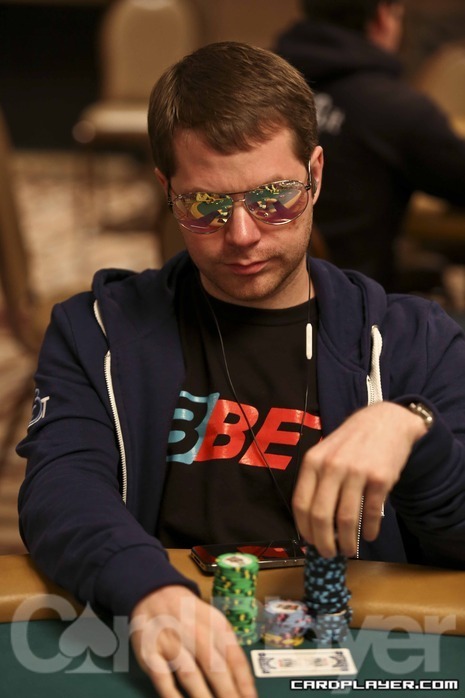 Daniel Fuhs bet 25,000 from middle position and David Baker made the call from the button. Little check-raised for an additional 95,000 and Fuhs mucked. Baker made the call and the river fell 2 . Little checked and Baker moved all in. Little made the all-in call after some thought but he didn’t bother to show his cards after Baker turned over pocket fours. Little took home $21,116 in prize money in 38th place and Baker grew his stack to 1,190,000.